Waterford County Museum: Local Business Help Solve an Ancient Mystery! 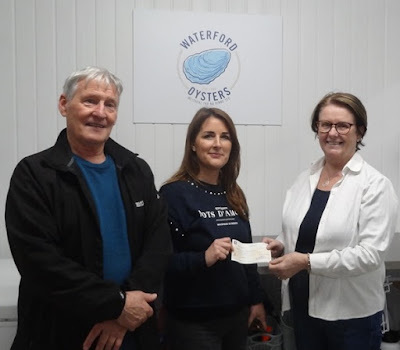 Pictured: Eddie Cantwell and Chrissy Knight O’Connor (Waterford County Museum/Gallows Hill Project Coordinators) receiving a generous donation from Clíona Mhic Giolla Chuda (Waterford Oysters Director). A great big thank you to Michael Burke Snr and all at Waterford Oysters (Meitheal Trá na Rinne Teo). A massive thank you to Waterford Oysters (Meitheal Trá na Rinne Teo) for helping us achieve our goal to carry out detailed scientific analysis on the human remains found at Gallows Hill. These finds have been a major discovery in Dungarvan’s history and with the help of ground breaking technology we plan to tell the story of each individual. Ancient DNA will now also be carried out thanks to the fantastic support of Waterford Oysters and who knows maybe we can find some living local relatives! There is so much to learn from the finds at Gallows Hill and the next few months will reveal some exciting revelations. The Gallows Hill project would not be possible without the incredibly generous donations of local supporters and businesses. Funds are still required to complete further isotope analysis to uncover this fascinating story and all donations will be really appreciated. Our main concern now is a further dig at the Mound that this time could take up to four weeks. In order to complete the archaeological excavation at Gallows Hill, large funds are required and it is hoped that some organisation will have pity on us and come forward to fund the dig. Sadly, on a recent visit to hill, we discovered evidence that bonfires have been lit once again on top of the mound where the human remains were located. This certainly should not be tolerated on such an historical site, and we appeal to residents in the area to please contact us if such behaviour is witnessed by them.